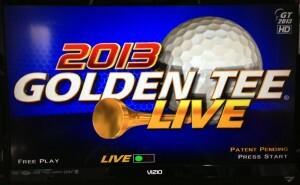 During July 2016, Golden Tee hosted an event called “The Ultimate Cycle” where home edition owners were invited to play all 55 LIVE courses at least once during the month in order to receive a discount on their 2017 upgrades. Of the thousands of home owners, 126 accomplished this feat. But for me, that was the easy part. The real contest was in seeing how great you could make your total cycle, since your best score on each course is the one that counts. This contest required a lot of skill and a lot of time invested. I decided I was going to go all-in to see how high I could place. I’ve done something like this before just for a little self-competition. Last summer, I made it a goal to shoot -25 or better on all 50 courses. 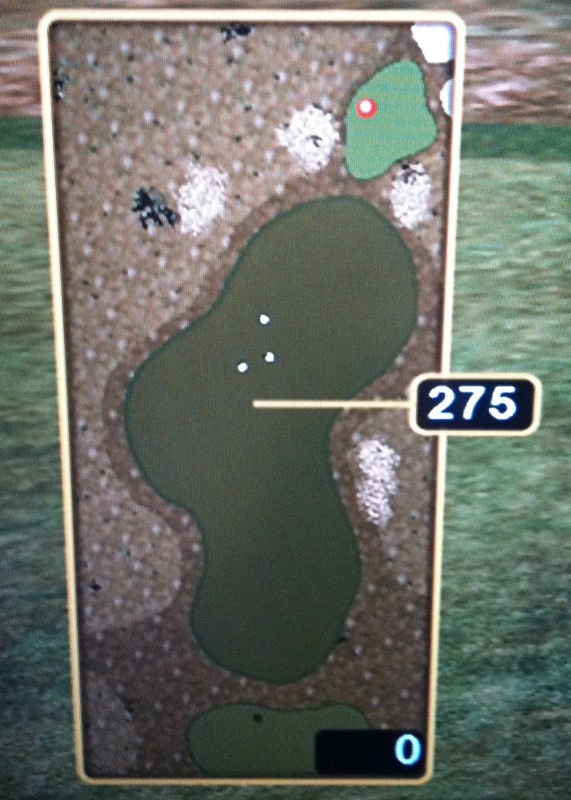 I granted myself an exception when I hit -24 on Eagle Crest, which is “GT Par” for that course on most occasions. I got 49 of them before finally getting Southern Oaks in the fall to complete the quest. Now keep in mind that took me 3 months. Here we’re talking about trying to post similar scores, even better, in just 31 days. Any night off could mean another player gaining strokes on you. But here was the thing — you never knew how the competition was doing. 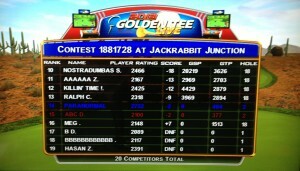 This event was completely blind, save the few random posts on the Golden Tee Home Edition Owners Facebook page to report progress. No one knew what it would take to win or how others were doing. My commitment was about 5 days a week for about 3 hours at a time — mostly evenings on weeknights. Balancing a full-time job and a family didn’t afford me much more, but I was content that I could make a good run. All in all I’d guess I put in around 65-70 hours for the month. 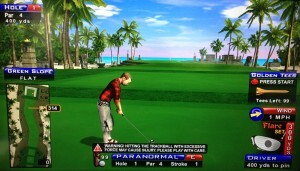 My approach was to play each course until I scored within a few strokes of GT Par, and then move on until I completed all 55 with a decent score. Then I’d go back and clean up with the time I had left. As you would expect, there were certain courses that ate up 2-4 hours alone until I was happy with my score to move on. Among these were Sequoia Grove, Auburn Glen, Black Hills, and (for some reason) Monument Valley. 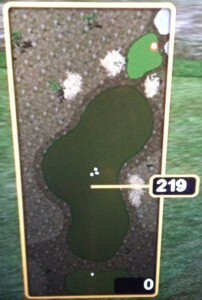 Shady Acres is another really tough course where I was content with a -23 after 1-2 hours. I fared quite well on the other tough courses, managing a -25 on Royal Cove, a -25 on Southern Oaks and a -24 on Tundra Peak with only a few tries each. Also as expected, some courses were “one and done”, giving time back to improve in other areas. When I was done with my first decent pass, which was about halfway through the month, I think my total was around 1320. I set a goal of 1350, knowing the mental grind would be too much to expect much better. But to my surprise, with a week to go, I had risen to 1385. Now, all of a sudden, 1400 was in sight, and perhaps a place in the top 5, which had become my goal. 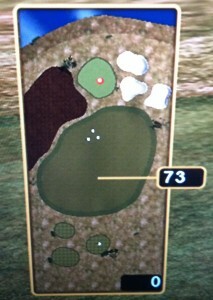 I don’t know if other players experience this, but many times, my best score on a course tends to be the first time I see it. If I know I have to play a course in repetition in order to achieve a certain score, which is usually near perfect, it adds immense pressure. 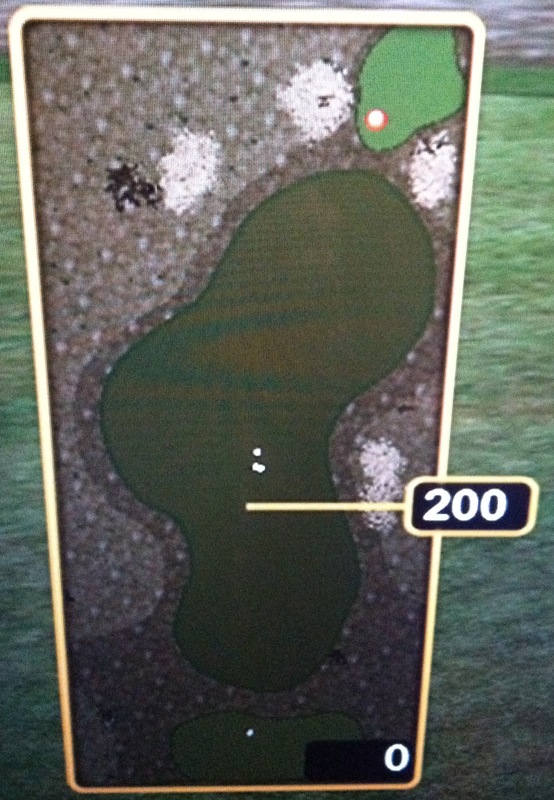 I lose focus on the easy holes because I’m just trying to get to the more difficult shots. 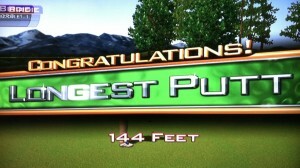 I start to miss putts because I’m impatient and just want to move on. Racking up DNF after DNF is incredibly draining, and it’s hard to come back time and again with the mental focus to execute cleanly. I’m happy there wasn’t a camera on me capturing my anger, frustration, and disappointment that come with my competitive nature. But then you hit it — you finally hit that score, and man is it sweet. This contest required incredible persistence. Celebrate, and then move on to conquer another one. Top score and second place were out of the question for me — I knew Tony Johnson and Michael Bowling would get those. But with how things were going, I had an outside chance at 3rd place, and I thought I’d be around 5th at worst with a couple other guys I knew would have big cycles. There are those who might not be as good as you but can put in a lot more hours, and there are those who are better than you but might not have as much time. I had a pretty good combination of skill and time to be in the race. On Saturday night the 30th, I hit -1400 even. What a landmark. That was it, I said…that’s the best I can do. I left nothing out there, and I was satisfied with every score I had. And then Sunday came, and I had a couple more hours free in the evening. May as well see what happens, right? Well that 1400 turned into 1405 when the clock ran out, and I knew I had a chance at one of the big prizes. Highlights of the cycle included my first ever “2-better”, a -28 on Grand Savannah; a near one-better -29 on Pearl Lagoon where my 75-foot uphill putt on the 18th came up just short; an even -28 on Indigo Mound; being on pace for -31 on Whispering Valley and then turning it into a -27 on the final 3 holes; and finishing Sunday night the 31st with a final game of a one-better -29 on Rocky Hollow. On Tuesday, we found out that my score was good enough for 3rd place and a new Callaway wedge! The wedge will be cool (I actually need it), but the satisfaction of scoring 3rd out of 126 finishers and thousands of home edition owners was pretty sweet. Feedback on this event was very positive, and I’m sure we’ll see it again in 2017! I have been ecstatic with the online play offering in the first month it’s been available. So what makes it so much more fun? To me, it’s that every game counts. I’ve always been a numbers guy, so I love accumulating statistics with each game played. Shooting for new personal bests has a new excitement to it — it’s satisfying knowing that the -27 I shot on Cape Haven isn’t just a high score on my machine, but it goes with my card and my account anywhere I go now. What’s my average on Bear Lodge this month, and how does that compare to the other courses? 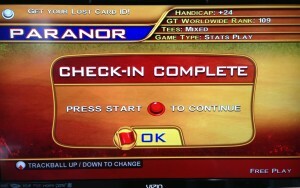 That’s all tracked automatically, and I can just go to goldentee.com to sign in and check out how I’m doing. It’s also the online leaderboard, which I have a renewed interest in now. Before the home edition, I’d just play a few games a week at the bar, which wasn’t enough to shoot low scores to give myself a chance at a decent monthly rating. Now I’ve already paid for unlimited games ahead of time, so all I need is the time to play. It’s fun to say that I’m #92 in the world this month. If I don’t like that, I can play as often as I wish to try to better my scores. Suddenly a decent world ranking is achievable! Of course the customized golfer adds to the fun of the game at home now. Where before you had to change your outfit at the start of each game, now you just swipe your card and your golfer comes along with it! So when you start dropping hole-outs over 150 yards and sending those great shots to YouTube, your style comes along with it. New holiday outfit available? The Give Away Code option is still there to add these items to your wardrobe when they come along! And another personal benefit is instant access to record scores in my GTF League on a weekly basis. It was difficult to justify playing 5 games a week, spending all that money just so I’d be a participant in my own league. With the online hookup, I get to record my scores at home and reap the benefits of cash winnings without having to put any money in the machine! How about improved play? When you know that every game counts and you combine that with the comfort level you gain with your own machine, your scores start to get much better. I saw my handicap jump up by 3 after just a month — an improvement I hadn’t seen in 3 or 4 years! With that comes a confidence boost that you can not only destroy your friends but also hang with any other tough local competition. But are there any drawbacks? Possibly. Once you get comfortable with any machine, it can be difficult to perform well on another machine in a different environment. I’ve gotten quite comfortable shooting low scores at home, but I’ve learned that putts at home break more than putts at the bar machine. I also have a harder time with chip shots at the bar than at home. These differences can be a combination of a smoother trackball, a larger TV, a pedestal that may not be completely square with the screen, a cramped space, or anything. In any case, there’s something to be said for mastering diversity of machines, and the best in the game can adjust to these changes without seeing their scores falter. Casual Play allows you to start a game quickly without swiping a card or tracking statistics. 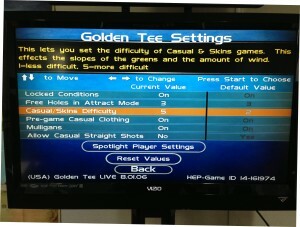 The Home Edition lets you adjust the difficulty of Casual Play from 1-5. On level 1, you get all the front tee boxes, not much wind, and lesser-sloped greens. On level 5, you’ll see different tee boxes (more often from back tees), more wind, and more slope on the greens. You can also set the “straight shots” option for true beginners who want assistance keeping their shots on line. The other benefit of casual play is mulligans! Since this mode is for players who are fairly new to the game, you can take advantage of mulligans to practice all kinds of shots over and over until you get them right. Mulligans are a great feature that allow you to improve and practice more effectively. The big drawback of Casual Play is that you cannot use any of the high-performance equipment normally available (clubs, balls and tees). 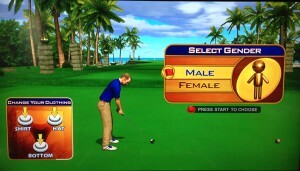 You can customize your golfer at least, so dress up and have fun! 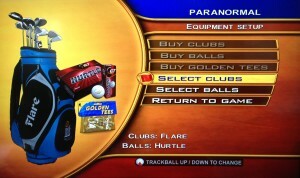 So, use Casual Play to learn the basics of the trackball and manage the courses, but move on up to Stats Play when you are ready to enhance your game using different clubs, balls, and Golden Tees. 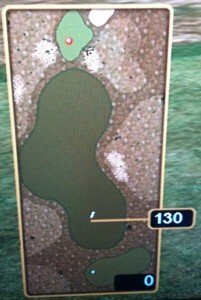 With two or more players, Skins Play is still around so you can compete with your buddies to see who can take home the most skins/money by winning holes as opposed to stroke play. Here’s where the fun begins for online play from home. Choose Stats Play to begin a game with random course conditions every time, swipe your card, and have your stats tracked against your account! As far as I can tell, the difficulty for Stats Play rates a 5 out of 5, matching LIVE play. 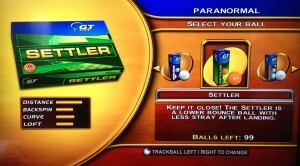 So pick your weapons of choice and get started without fear of running out of balls or tees! 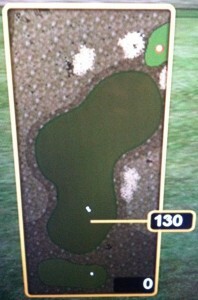 Stats Play automatically randomizes your tee box based on your skill bracket. 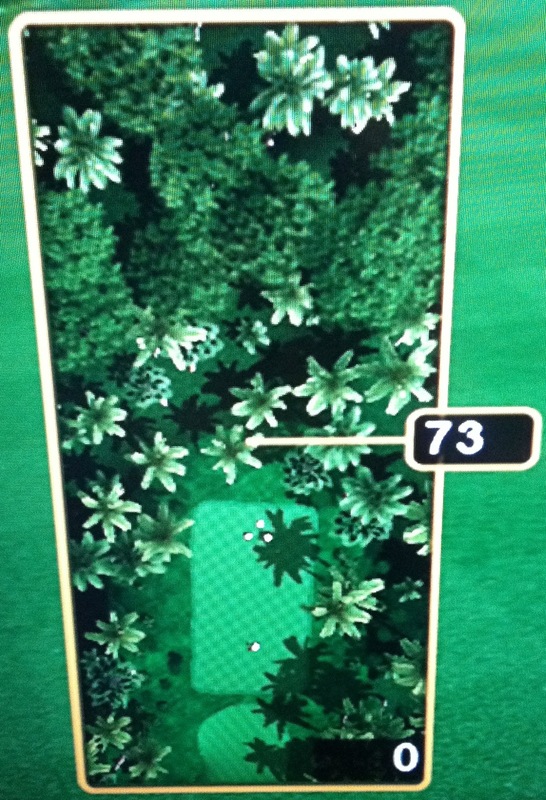 You have the ability to YouTube any hole-out from over 150 yards, but hole-outs (including aces) from under this distance don’t provide you the option for an upload. LIVE Contests work the same as Stats Play except you are entered into a random 20-person contest to see how you can finish against other online competition. 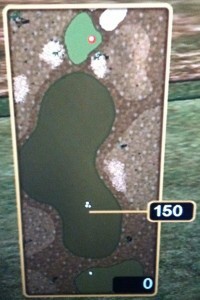 You may start out in Red, Blue or Black tee zones based on your skill bracket. The Pro bracket with Red tees gets all front tee boxes and easy drop zones, while the Elite bracket with Blue or Black tees gets a mix of tee boxes with the standard drop zones. 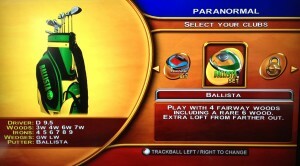 However, you have the ability to choose “Play Random Tees” from the Options menu at any time to avoid always having the back tees — this mode is similar to LIVE Play for Prizes that you see at the bar. You can also be entered into the same contest more than once when not playing for prizes in the home edition mode. So, if you finish a game on Cape Haven and feel like you can shoot better, you can start another LIVE contest on that course. 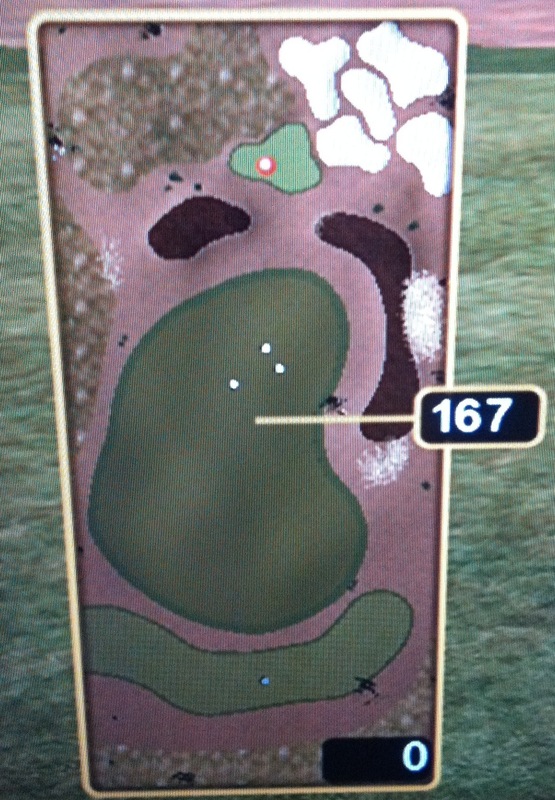 If it’s not filled up yet, you’ll be in the same contest with the same wind and pin placements. 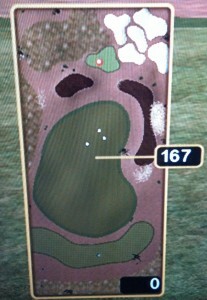 However, if you play random tees, then you may have some different tee boxes the next time around. Again, the difficulty level for LIVE play matches what you would see for LIVE Play for Prizes at the bar. 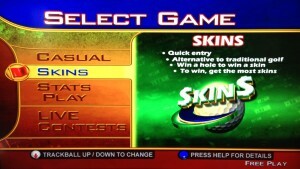 If you don’t have a Golden Tee card, you won’t be able to enter a LIVE contest — you’ll be redirected into Stats Play instead. 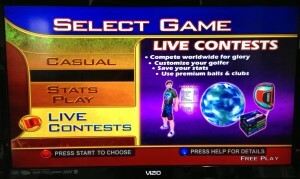 If more than one person is playing and at least one of you has a Golden Tee card, however, you can all play in the LIVE contest. Just have the player with the card go first, and the others can begin without a card. In general, I always start my first game with LIVE Play. And why not? It’s fun to be part of a contest. 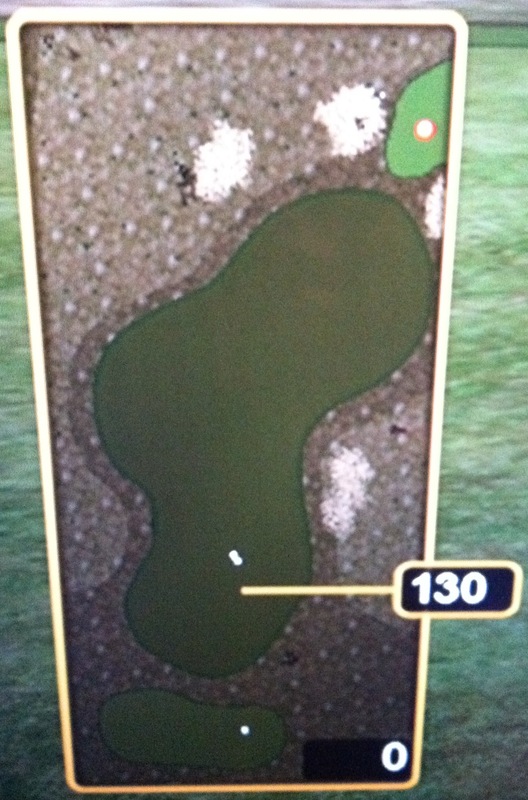 Just remember before you start (or as soon as you remember) to select “Play Random Tees” so that you aren’t always stuck with the back tee boxes. If you want to play the same course again soon after, you just have to decide if you want to try the same conditions (wind and pin), or if you want a fresh set. 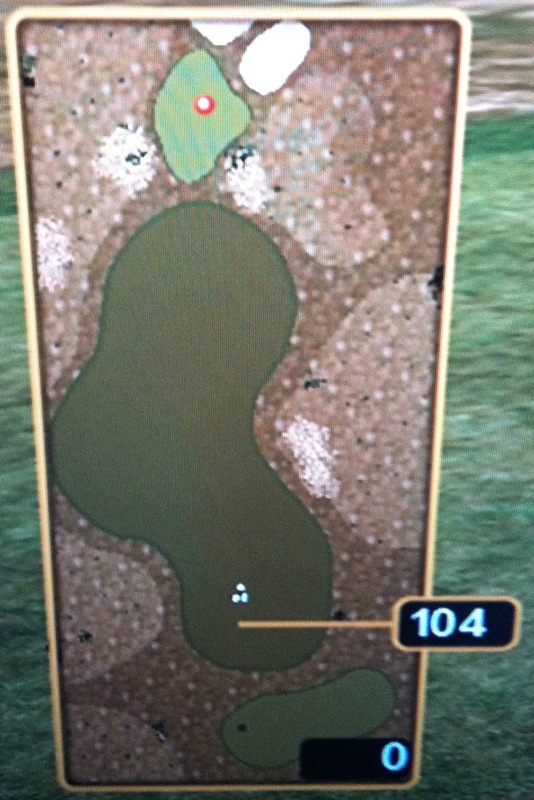 Stats Play always offers a new random set of conditions, and I usually opt for that if I’m playing many games in a row that include the same course. Stats Play is also a must if you’re trying to reach a new low score and you didn’t score well on the conditions the last time around. 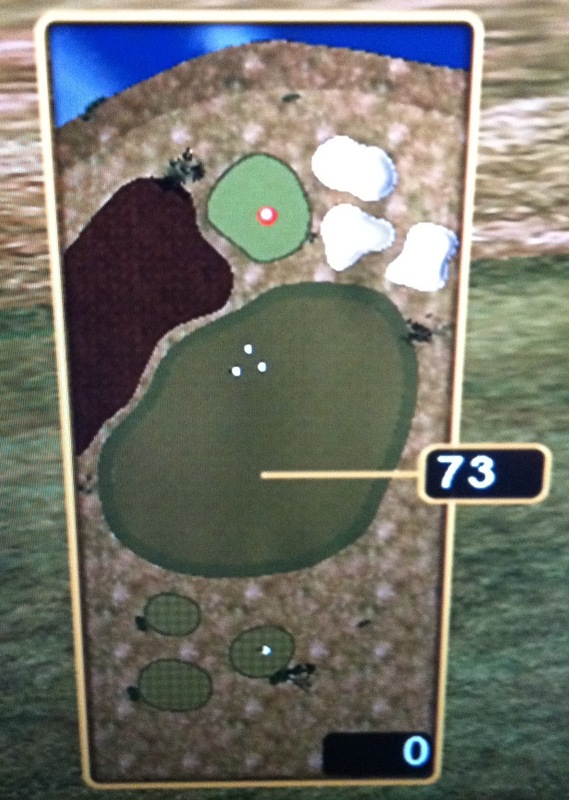 One fun thing about finishing LIVE contests is that they show up on your scores feed when starting the 2nd hole. Stats play scores do not show up since you didn’t earn a rank in a contest when completing that game. My game is in my basement, and my home computer network (router and modem) are upstairs. 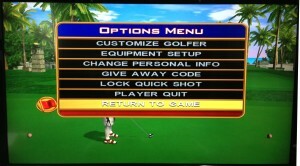 For me, the best option was to configure a wireless ethernet bridge to get my Golden Tee home edition online. There are simpler versions available, but I went to Radio Shack and found a NETGEAR Universal Dual Band WiFi Range Extender. 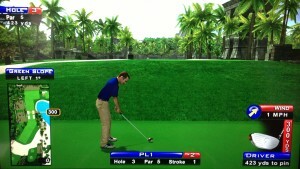 Plug this into the wall somewhere close to your Golden Tee machine. Then it gives you a couple options for establishing a connection with your home network. For me, I just booted up my laptop to find the NETGEAR SSID wireless network — you connect to that first. When connected, I launched a browser window from my laptop that took me to a setup guide. The key step in the setup guide is establishing a connection with your current home wireless network. 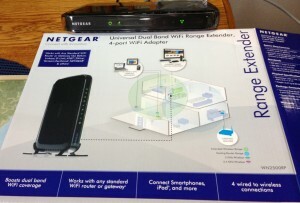 Once connected, you then pick a name for your “Extender” network that is now available. After that, your wireless ethernet bridge looks like any other router that has a wireless connection. 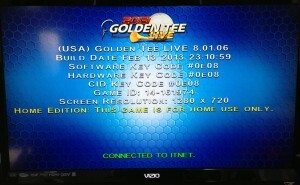 Now just plug the ethernet cable from the game into the ethernet bridge and boot up the game — you will then have your Golden Tee game hooked up to the internet and communicating with ITNet! This process starts the same as any other software update — details of that process can be found here. However, with this special update, there are two additional steps. After the software upgrade, you’ll install a card reader. Technically, you can function without a card reader and play online using your Lost Card ID, but that’s no fun. Swiping a card and playing online from home is pretty sweet, so you’ll want one. 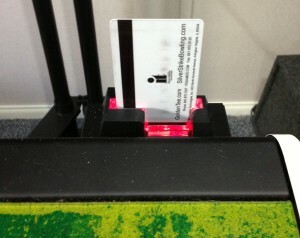 Installing the card reader is also very simple. It comes as one unit, and all you have to do is plug it into another open USB port on the system box and screw the mounting portion of the card reader onto the back of the machine into pre-drilled holes. I know, it’d be fun if it were mounted in the front like you see at the bar, but the cabinets are different for the home edition. This is how it looks when you are done! The last step is setting up your ethernet connection. There are two options here. The system box under the hood has an ethernet port already, and the upgrade comes with an ethernet cable (or you can use your own). 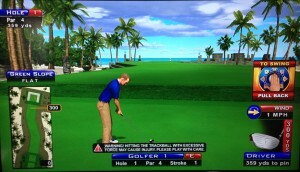 If your Golden Tee is close to your home computer Internet connection point (router and modem), option one is to plug the ethernet cord from the game into your router. If not, option two is to buy a wireless ethernet bridge, plug the cord into the bridge, and have the bridge communicate back to your home network. This is what I did, and more detail on that setup process can be found here. 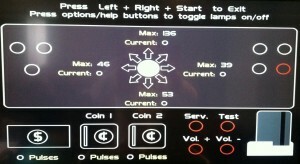 Once your ethernet is plugged in, you just need to test your connection through the game setup options! For me, the connection worked immediately, and my game was talking to ITNet right after the setup. Finally, your home edition must be registered with IT, and your online subscription must be active. Use this link to contact IT to get all that set up, preferably before you do the software upgrade, so that you can be ready to go right afterwards! They’ll just need your machine’s Cabinet ID to get it registered. Once active, you’ll get an email with a link to manage your online subscription through a special GT Operator Services website. This site allows you to see your subscription status and adjust settings on your game (although you can do this directly on the game itself too). This site is mainly for vendors to manage their machines, but it’s cool to see what it looks like as a home edition owner. With all this in place, when you boot up your game, you’ll see that you are connected and have a green light for online play! You’ll receive a dual in-line memory module (DIMM) to upgrade your memory to 1GB, but if the serial number of your machine is above a certain value, you don’t have to mess with this. Newer machines, including mine, don’t require this RAM card update. 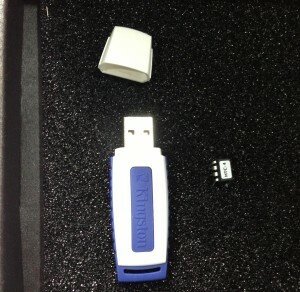 The other two pieces you receive are a new security chip and a memory stick on a USB flash drive, shown below. First you remove the old security chip from the I/O board under the hood, and then you stick in the new one. It has 8 thin little pins, so you have to be a bit careful to make sure they all fit in the holes properly, but I’ve never had an issue with this step — just pull the old one out and stick the new one in. Next, there’s an open USB slot on the system box. You just stick the flash drive in there, and turn on the game. The machine detects the update stick in the drive, and the upgrade installs! When it’s done (10-20 minutes or so), it will prompt you to turn off the game, pull the memory stick out, and then reboot the game. When it boots again, you’re active on the new version! If you are upgrading your game to the online version, click here to read about the additional steps required to get that all set up! I always knew that B1 and B3 shots came back towards center, but I was never completely sure how much. 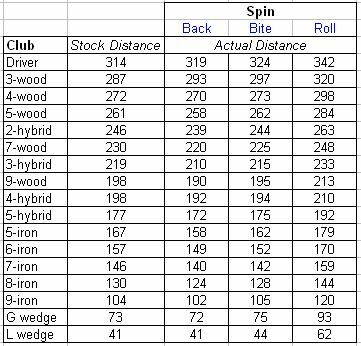 I also thought that lower-lofted clubs should cut back to center more than higher-lofted clubs, but how much — what would it really look like? 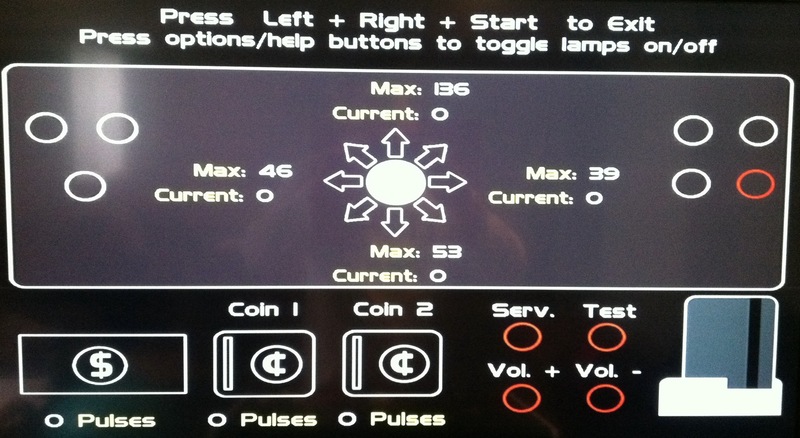 These experiments were conducted with the Flares and Hurtles as I started up a 4-player game. Player 1 shot a B2, player 2 shot a B1, and player 3 shot a B3, and I recorded all the distances. 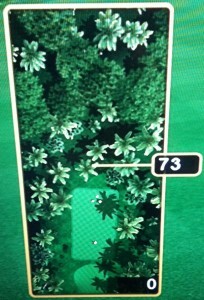 Then I took a picture of the relative lies of each shot from player 4’s perspective on the tee. CONCLUSIONS: When determining final relation to center with your B1 and B3 shots, loft isn’t everything — whether or not you’re hitting an iron matters more! 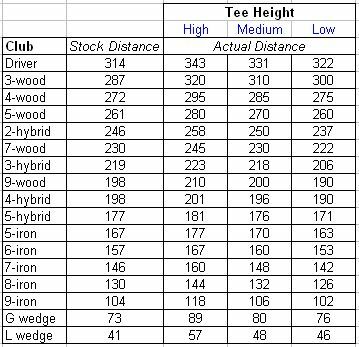 Drivers and hybrids don’t cut back to center, while low/medium-lofted irons will cross over center, and lofts up to a 7-iron still end up back in the middle. Also, B1 shots tend to sweep out farther and end up shorter, while B3 shots don’t angle out as much and travel a bit farther. This is likely due to the nature of the trackball and its rollers, and it’s also why left-breaking putts seem to break more. 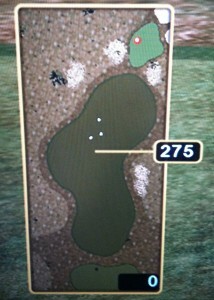 Finally, don’t forget to consider the distance lost when playing these shots as compared to straight B2 shots! 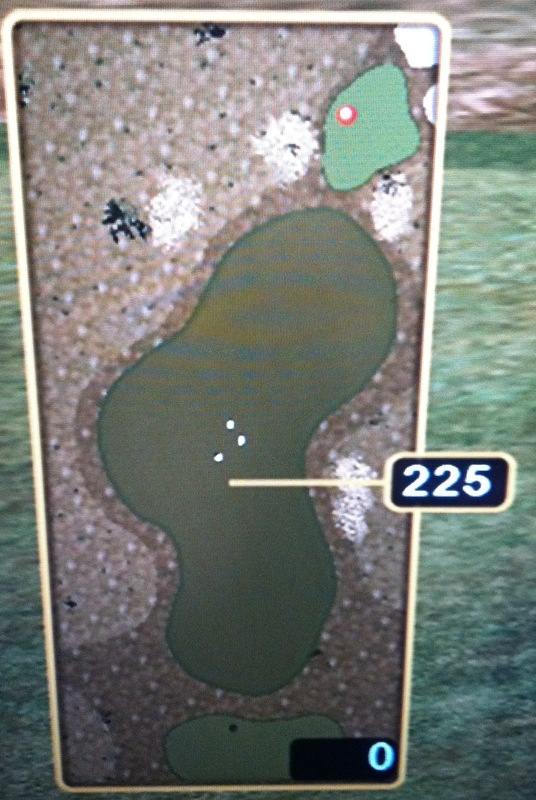 How many distances can you hit a driver? I had always wondered how sensitive the trackball was in measuring distance relative to the speed of your follow-through on the trackball, so I set up this experiment: I wanted to see how many different distances I could hit a driver without pulling the ball back. 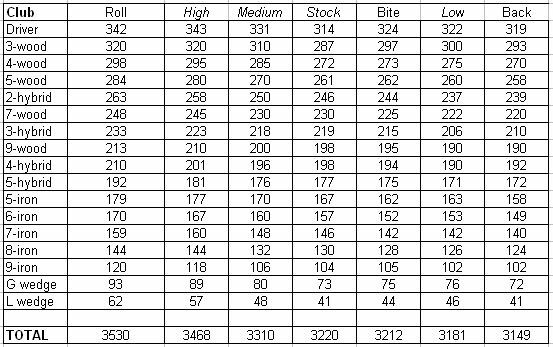 I printed out a grid containing all numbers from 1-400, and then I crossed them off the list as I achieved that distance. These shots were performed off the tee to a long, flat fairway with the Flares and Hurtles. I was very impressed with my findings. I was able to nail every distance from 45 up to 350 yards with no more than 3 yardages missing between any of the distances! 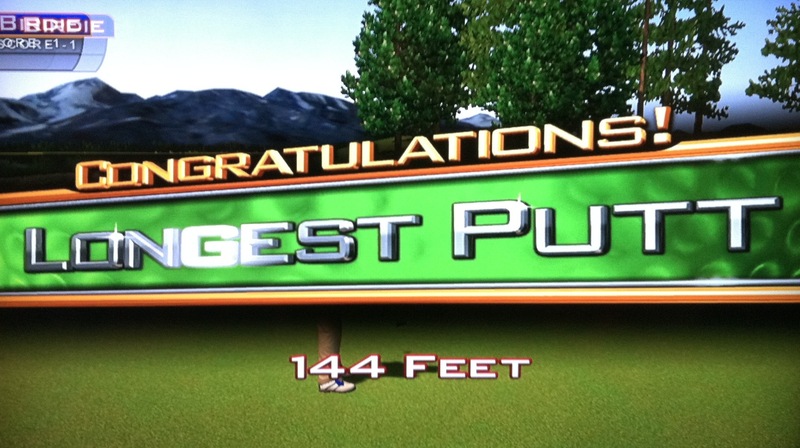 For instance, I hit a shot 344 yards and another 348 yards, but I was not able to hit 345-347 during this test. 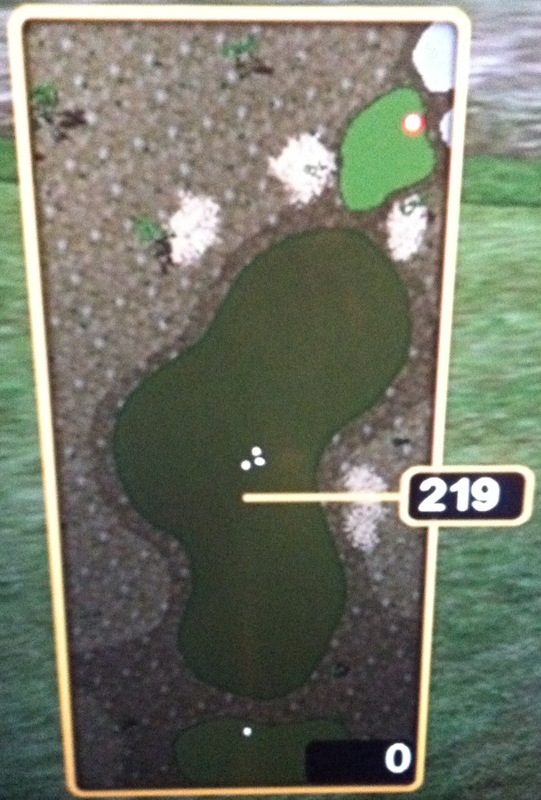 There were only a few gaps this large, as I was able to hit most of the distances. An interesting note is that I needed to thumb some shots to the side towards 1 or 3 to achieve different distances. Shooting straight forward limits the distances you can achieve. 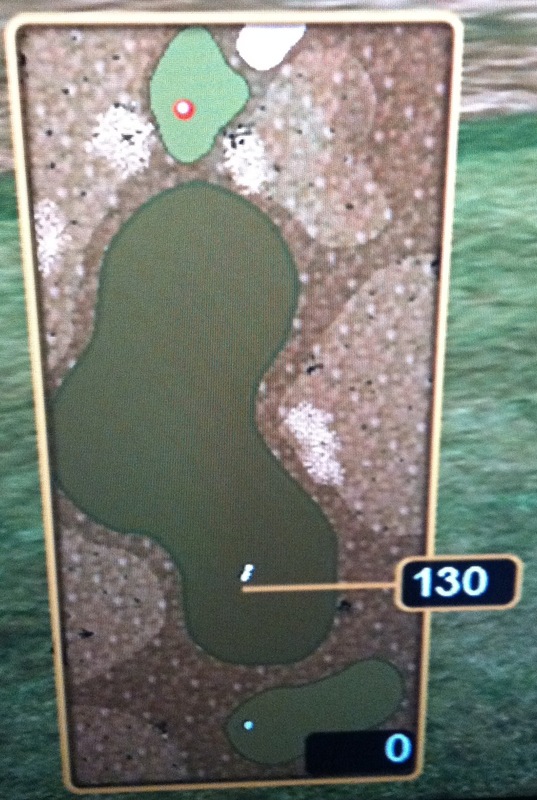 So, while it’s not practical, you could nail a different distance by rotating right once and thumbing a shot out towards 1. The type of shot matters too, as I used one-thumb flicks to two-thumb shots to hammers with the palm. 45 yards was the shortest I could get. I did this with both an angled shot towards 1 or towards 3. 51 yards was the shortest I could get shooting towards 2. 348 was the longest shot I had (again, this was with no pullback). That was a hammer straight ahead. I was able to hit 331 yards with the firmest thumb shot I could muster. I noticed something very interesting when flicking thumb shots out to the side. 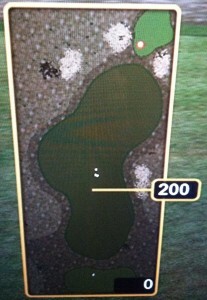 You can actually see the ball curve back towards center, as if you were hitting a B1 or B3 shot! You’ll notice it dive down a bit too, as if you were throwing a slider. And, because of this, shots to the side with the same speed carry less distance. Since the ball has a slight curve back towards center, it hasn’t traveled in a perfectly straight line, and thus it has lost distance to a shot straight ahead. The home edition lets you perform a trackball test in the setup mode, where you can make sure the ball is rolling smoothly in each direction. You can also observe a number related to the speed of your shot. 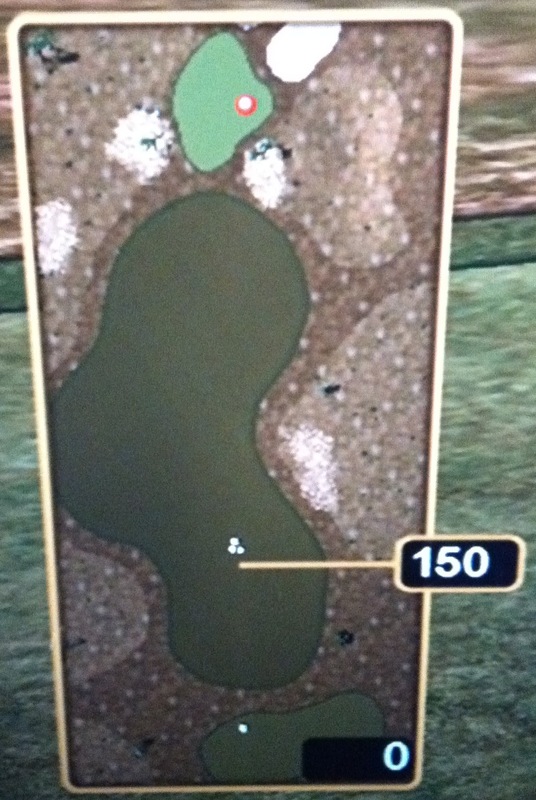 For instance, I was able to hit forward with a minimum distance rating of 16 and a maximum distance rating of 136. 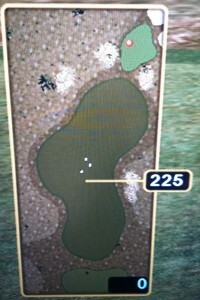 The sensors correlate to one of these numbers which helps determine your yardage on the course. Each person’s touch and feel could potentially achieve different distances, so I believe that although I didn’t hit all the yardages, it should be possible! When you factor in a pullback, you can certainly achieve any distance below the max with any club given a flat fairway ahead.